Ilaria Tuti’s Flowers Over the Inferno once again demonstrates the importance of giving readers access to crime fiction in translation. Crime fiction, done well, provides a window into different places and cultures. While many of the tropes and techniques remain the same, the spin on these, and the revelations they provide are often unique to their environment. So that a Japanese crime novel like 2018’s Newcomer by Keigo Higashino, while strictly a procedural, is completely different from Gone by Midnight, the most recent of the Candice Fox series set in Far North Queensland. 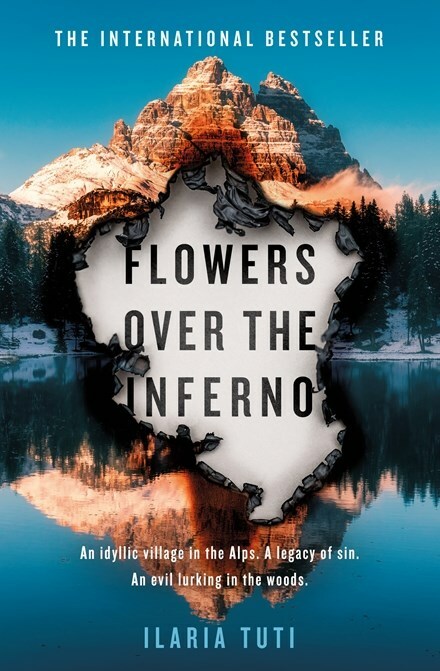 And so to Flowers Over the Inferno, Ilaria Tuti’s debut (translated by Ekin Oklap) set in the Italian Alps, in a small skiing village close to the border with Austria. A man is found dead in the forest outside the village of Traveni. The homicide squad, led by Superintendent Teresa Battaglia is called in. Teresa is a veteran detective and master profiler who is well respected within her department. The reader’s entrée to this world is that of newly transferred detective Massimo Marini. Marini and Battaglia immediately clash but only because of the high standards she sets for her team (and everyone else around her). But Teresa is carrying secrets, not only does she have diabetes but she is also showing the early signs of Alzheimers and is carefully hiding this from the world. The story starts as a typical serial killer thriller, and even Teresa treats it in this way. But historical interludes and some puzzling point of view chapters, hint at something deeper. That perhaps something more is going on than just simply a psychopathic monster preying on the village. Certainly the village itself holds numerous secrets, many being protected by the chief of police to the detriment of the investigation. Teresa Battaglia is a singular and unique character. A strong, forceful woman in a very male world, an intuitive investigator, revered by her team, now fighting a disease that threatens the very core of her work – her memory and the ability to make connections. Like many of her fellow fictional detectives she has a driving force to get to the truth and does not suffer fools or obstacles to getting there. In Flowers over the Inferno, Tuti gives a real Italian flavour of the characters, the town and landscape, from a place of deep understanding. And while there are monsters and wrong doers in this story they are not who they first appear to be, nothing is quite as it seems and there is a deep strain of compassion and empathy running through the solution of the crimes and their resolution. Flowers over the Inferno is an atmospheric, debut and sets Tuti up for what promises to be a unique series.